RGB lighting in computer hardware, especially gaming-branded gear, is a divisive subject. Either you think it’s really cool and you want it in all your stuff, or you have good taste. (I kid, I kid.) But despite the rather flashy nature of LED-soaked “battlestation” gaming setups, there’s actually a surprising amount of utility to be found deep in all that rainbow-colored extravagance. Even if you aren’t a fan of the aesthetic, it’s worth considering the next time you’re assembling a gaming PC. Here are a few of the useful things you can do with those flashy lights. This one’s a bit of a no-brainer, but creating a lighting layout for specific games can help you remember the key bindings for various titles. 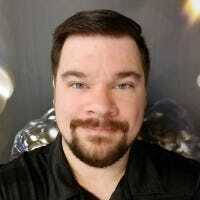 It’s especially helpful if you often play different types of games, going from a WASD-heavy shooter to a hotkey-laden MOBA game to a custom-bound setup for a deep strategy or simulation game. Using color groups for different kinds of actions is generally the best way to go here. Setups typically break colors into movement, basic attacks, special attacks, healing and other modifiers, and custom macros (see the title photo of this piece). More robust programs offer pre-made RGB themes for popular games, which can be downloaded and installed. There are plenty of ways to show your system’s operating information, like current CPU temperature or fan speed. But since you’ve invested in a fancy windowed case and a bunch of RGB lighting, why not put them to some practical use? Some high-end motherboards include both LEDs directly on board components and lighting control integrated into their software. 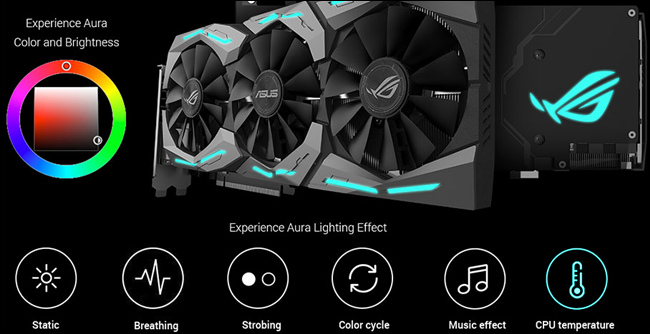 The high-end lighting systems from ASUS and Gigabyte includes direct access to temperature sensors, letting the motherboard, GPU, other components, and any attached 4-pin LED strips shift from blue to red to indicate the CPU temperature or current load. Naturally, it’s not as precise as a numerical layout, but for some quick at-a-glance info while you’re in an intense gaming, it works well enough. The add-on NZXT Hue+ system can even shift color based on your current game’s frames per second. The various accessory vendors are now releasing full software development kits and APIs for their LED-equipped gadgets. Razer, unsurprisingly, has delved the deepest into this particular pool. Its online gallery of user-submitted Chroma tools includes stand-alone games like Snake and Whack-A-Mole that can be played on the keyboard itself, an audio visualizer that plays across all RGB-enabled devices at once, and even reactive weather app that displays the local conditions. There are also integrations with various third-party tools. In addition to the usual customized game profiles (the countdown timer for bombs in Counter-Strike is particularly neat), users have made Twitch volume tools, Photoshop and Illustrator palettes, and even an Outlook widget for unread emails. At the end of the day, you might as well embrace the disco ball flashiness of your coordinated RGB setup. At this point Razer, Corsair, Logitech, and Gigabyte all offer online repositories of animated “themes” for their various gear and accessories. They allow you to download the reactive and pre-made animations created by other users. Your options will be limited based on which specific pieces you have (themes usually don’t work across devices from different vendors), with some having more engagement from the community than others. If nothing strikes your fancy, you can always make your own. Even the companies that don’t offer an online repository typically install of the companies that offer desktop software to tweak RGB setups also offer pre-baked “effects,” and tools like the Chroma Configurator allow you to tweak them to your heart’s content.